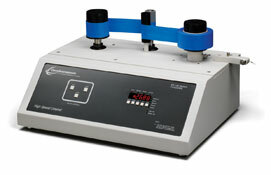 Accurately measure the unwind force of a roll of tape with the ChemInstruments High Speed Unwind Machine. The High Speed Unwind Machine meets the standards specified in ASTM D 1000 and AFERA 4008 for unwind force at a fast rate of removal. It will also test the unwind force of pressure sensitive tapes according to Test Methods PSTC-8 and PSTC-13. 美国ChemInstruments 公司研制的HSU-1000 快速解卷力测试仪适用于各种胶带卷动时的强度测试. 该机设计符合解卷力测试标准ASTM D 1000 及AFERA 4008, 并符合压敏胶带制品的解卷力测试标准PSTC-8 及 PSTC-13.